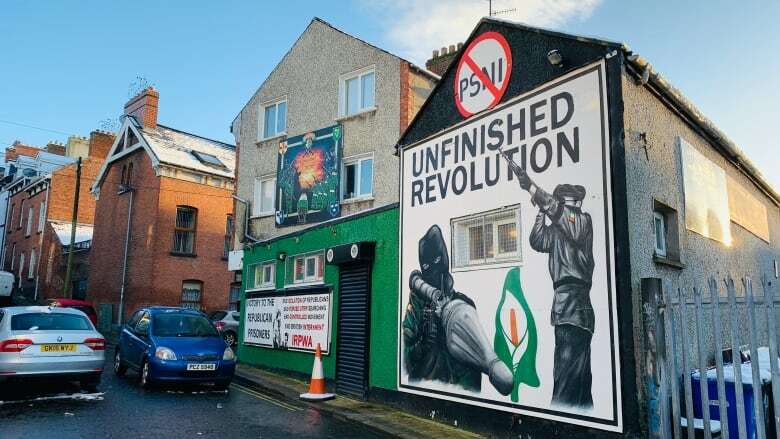 The murals outside the small offices of dissident republican group Saoradh give the first hint not all is well in Londonderry, Northern Ireland's second-biggest city, also known as Derry. One sign — featuring militants in face masks holding assault rifles — commands passersby to "join the IRA," the initials synonymous with the Irish Republican Army, which was once known as the most notorious paramilitary group in the region, deploying guns and bombs to fight for the reunification of Ireland. "RPG!" a boy shouted recently as he walked along in an elementary school group, referring to the rocket-propelled grenade launcher featured prominently on another mural. Such is life in a region shaped by decades of the conflict known as the Troubles. A longstanding guerrilla war of the late 20th century, it pitted paramilitaries loyal to Britain and Ireland against each other, and hardline Irish nationalist groups against the British Army. Allegiances were often — but not always — divided along Catholic and Protestant lines. "If you put up customs posts along the Irish border, people will shoot at them. There is no doubt about that," said Eamonn McCann, a Londonderry-based author who lived through the Troubles and who has written about the conflict extensively. "I'm pretty sure people within Canada think the so-called war has ended after the Good Friday Agreement was signed, [but] that's not the case," Saoradh spokesman Patrick Gallagher told CBC. The 1998 deal sought to give Irish nationalists and British unionists equal footing in Northern Irish politics and bring lasting peace to the region. "The fact is Ireland's still occupied," Gallagher said. He says as long as the "British occupation" continues, Irish republicans here will be willing to take up arms against Britain. "They have openly said they see this as a recruiting platform," the former assistant chief constable in Northern Ireland, Alan McQuillan, told the BBC. "They believe they can build their campaign from this. "There's a real threat," he said. Jenni Doherty, who manages a bookstore around the corner, said she heard an "almighty" bang. "I didn't know it was a bomb but thought: 'What in the name of God is that?' " she said. But the explosion was powerful enough to shatter nearby windows and leave the vehicle's outline melted into the pavement. It was the first car bombing this city has suffered in years and served as a jarring reminder of the type of attack Londonderry hadn't regularly seen since the Troubles. "It was scary," said Conor McGinty, a local singer who drove by the hijacked van with his fiancée and one-year-old son only minutes before it blew up. McGinty, 24, acknowledges he's too young to recall the worst of the Troubles, such as Londonderry's Bloody Sunday massacre in 1972 when British soldiers opened fire on peaceful protesters. Fourteen people died. "We went through a period of nearly 20 years of peace, and it's been torn apart really by Brexit," McGinty said, fearing the car bomb would be a sign of things to come. After Brexit, it will share the U.K.'s only land border with the EU, the current flashpoint in a difficult divorce. 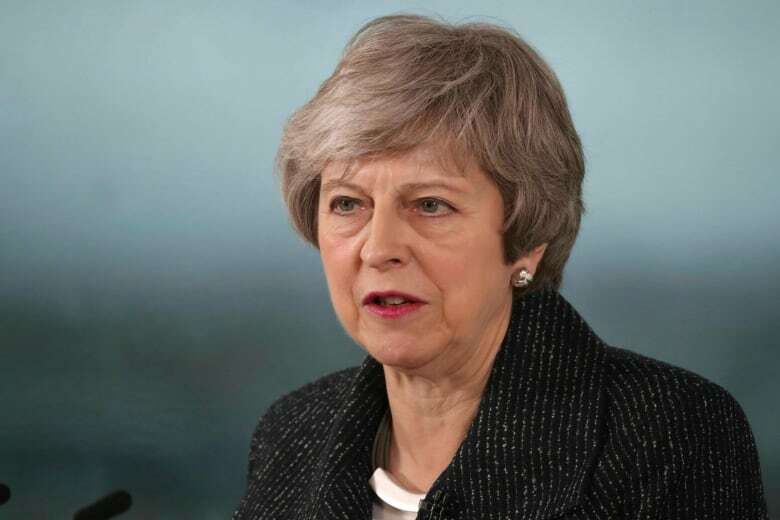 Her commitment to delivering Brexit without a hard border "is unshakeable," she told a Belfast business crowd on Tuesday. Since becoming prime minister in 2016, May has only rarely travelled to Northern Ireland. This week's visit signalled an attempt to quell deepening fears that Brexit cannot be achieved without new customs infrastructure at the border. Addressing the border issue and maintaining the peace remains the EU's "top priority," European Council President Donald Tusk said Wednesday, standing beside Leo Varadkar, the Irish prime minister. Tusk warned there's a "special place in hell" for those who promoted Brexit without a plan to leave the EU "safely." "The law of unintended consequences has been one of the main laws of Irish history going back centuries," said McCann said in an interview. "Nothing works out the way people expect it to work out." "I would not wish anybody to suffer the pain that I suffered. And to see it starting up again doesn't bear thinking about," she said at her Londonderry home. While the British Army operated border checks during the Troubles, Gillespie's husband Patsy worked as a cook at a military facility a few minutes' drive from their house. His role led republican extremists to consider him a "legitimate target of war," his widow said. The massive blast killed him and five nearby soldiers. Patsy Gillespie's remains could only be identified using pieces of the grey cardigan he had been wearing and the flesh attached to it. "One of the hardest things I've ever had to do in my life is to tell my son on his 18th birthday on the phone that the IRA had murdered his daddy," Kathleen Gillespie said as she shed a tear, more than 28 years later. The hardline republican group vowed to continue to "strike at Crown forces personnel and their imperial establishment," using civil war language to describe U.K. symbols in Northern Ireland. "All this talk of Brexit, hard borders, soft borders has no bearing on our actions and the IRA won't be going anywhere," read its statement published in the Belfast News Letter. But the frontier's newfound attention can't be so easily overlooked. The leader of the dissident republican group Saoradh recently said Brexit would bring the border — and resistance to British "occupation" — into sharp focus. "Brexit is showing up the fact that the island is divided, that we do have a border," Saoradh chairman Brian Kenna told the Irish Independent. He was convicted of IRA membership in 2017. "We went into Europe as part of the U.K. all as one and we'll leave all as one," said Graham Warke, a Democratic Unionist councillor whose party's 10 MPs provide May's Conservatives with a majority government. "We were stopping the bombs coming in over the border. We were stopping civilians getting murdered by these terrorists," he said. "I wouldn't want to be seeing that again."